It's a new comic haul, so get ready to see what comics I've picked up recently. This is actually about three weeks worth of books. I also accidentally worked one of those three weeks worth of books back into my collection before taking pictures of them, so I honestly have no idea what that consisted of. Rather than go digging through a bunch of boxes hoping to find them, I figured at the end of the day it didn't matter all that much and that this is enough content for the post. 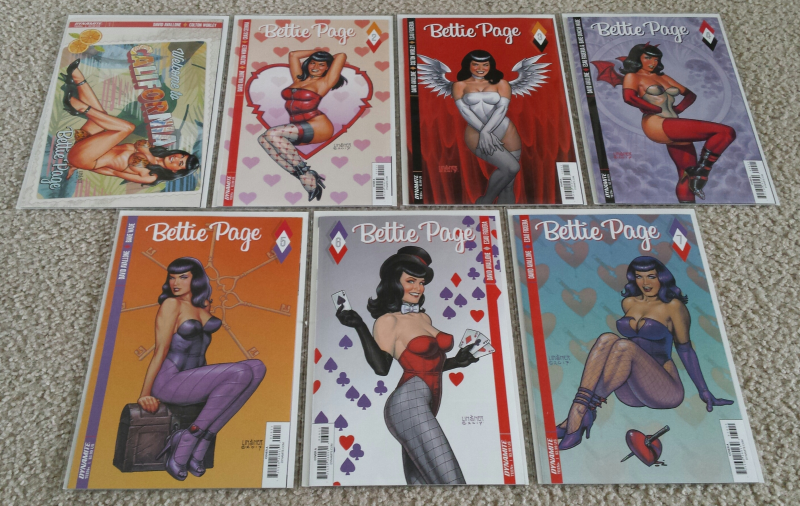 First up are these Bettie Page comics. The covers for all of these comics are done by Joseph Michael Linser, probably most famous for his character Dawn. Actually, I just recently bought a Dawn and Vampirella series he did which was part of the stuff I folded back into my collection before taking pictures of it. I really enjoy Linser's work, and I thought these Bettie Page covers he did were really spectacular. There's something about the coloring on his art that you can pick out immediately. It has almost a soft colored pencil look to it that's very striking. Speaking of Vampirella, I bought a few new old Vampirella books online. The center one is a chromium cover Amanda Conner piece "limited" to 10,000 copies. I guess that's limited, I don't know. Regardless, I do love gimmick 90s comic covers, and this is definitely one. As is the one on the far right. This is the last issue of Vengeance of Vampirella. Over the summer I found a Vengeance of Vampirella #1 gold foil variant at a toy convention for super cheap that was limited to 500 copies. The first comic here is an oddity. I ordered this online at My Comic Shop. It didn't make any notation on the site that it was signed by Adam Hughes and Caesar, so I was definitely surprised when I pulled it out of the box and saw the signatures. As I was looking at it, I thought it was too bad it didn't come with a certificate of authenticity. About that time the certificate fell out of the comic and onto my lap. Pretty good buy for $3.30. I'm not really sure why I picked these up. 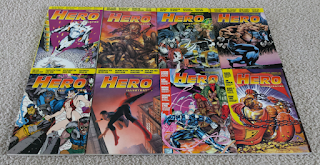 I guess I've just been picking up random stuff lately that catches my eye, which is kind of dangerous since I still want a laser focused comic collection. 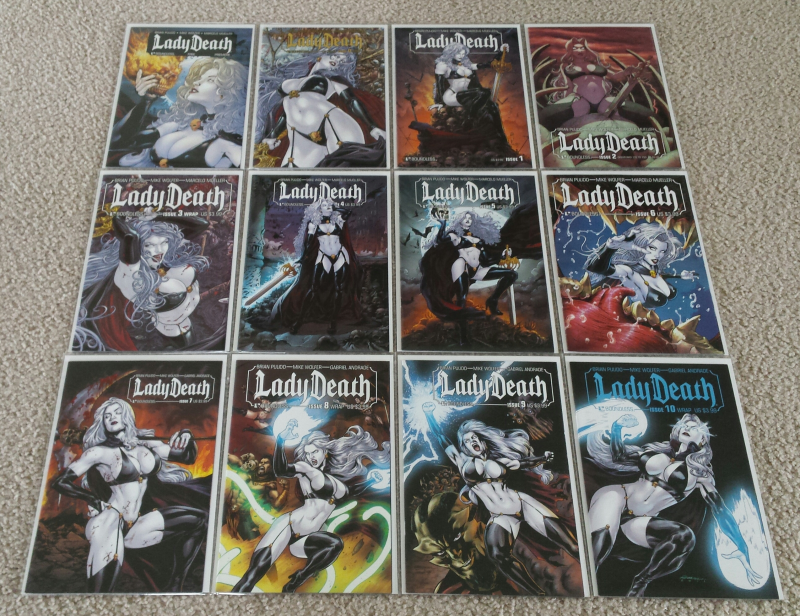 These Lady Death comics do fit in with my collection, though, because I do have a few of the old Lady Death series that were released back in the 90s. 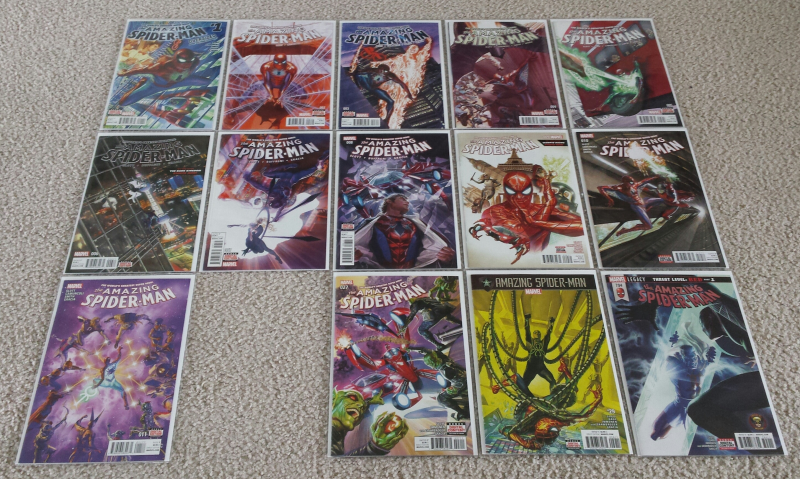 The art is really good in these and I think the covers are all really well done. There are actually several different covers for each issue, so it was kind of fun to pick which ones I wanted the most from the bunch. Since we're on a big 90s kick here, here are the first appearances of the two 90s characters Barb Wire and Ghost. You'd think the first appearances of these two characters would cost at least a little bit, but they were $1.70 each. There is a variant cover which costs $4.00 (still super cheap) but I just went with this one. 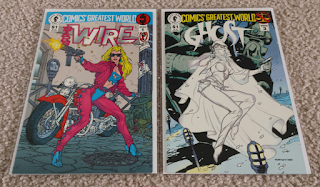 The second one here, Ghost, is one of those characters I was aware of back in the day but didn't know anything about. I still don't know anything about her, I guess. I know that her first appearance isn't worth anything. Moving on here. 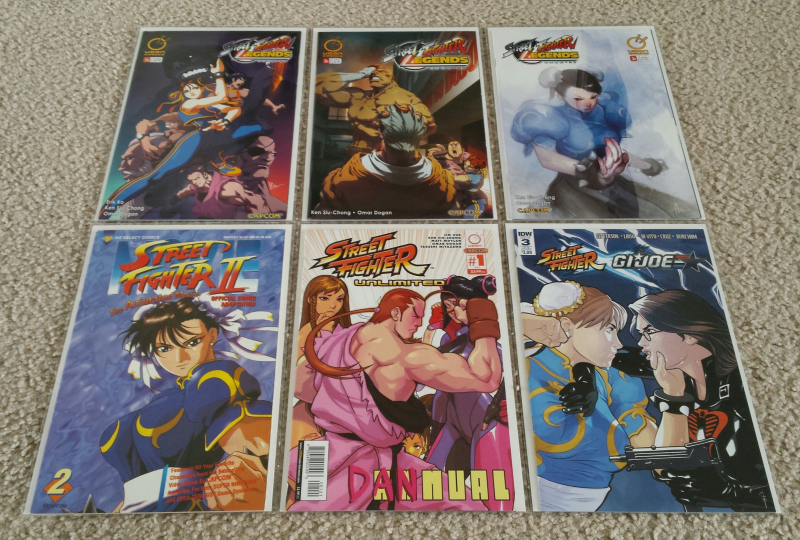 I picked up a few Street Fighter comics with Chun-Li on the cover. 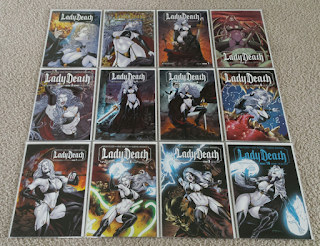 I already had the fourth issue of her series, so I went ahead and bought the first three. It's weird that I had the solo series for Sakura, Ibuki, and Cammy but not Chun-Li. The other comics here are just ones I liked that had her on the cover. 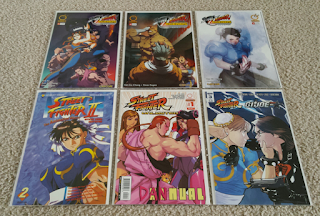 The first one on the bottom row is an issue from the comic adaptation for the Street Fighter anime, which was wildly popular at one time. 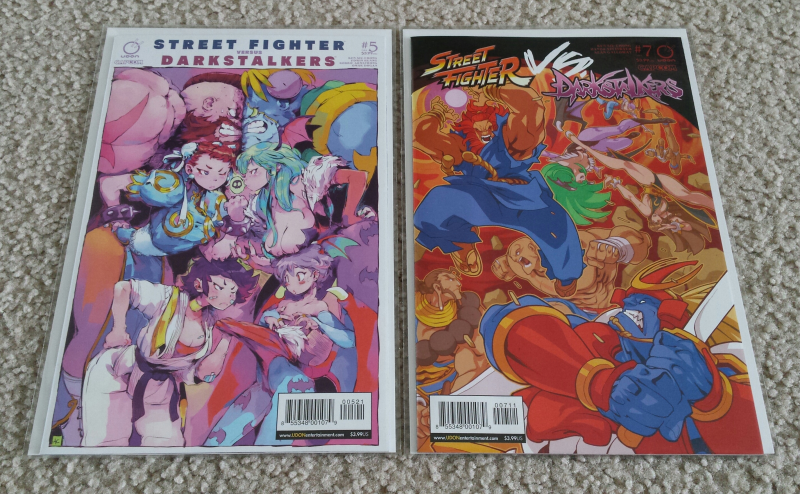 The second is a Rob Porter cover from the Street Fighter Unlimited annual where joke character Dan is making a scene. Then finally, the one on the bottom right is a Street Fighter vs G.I. Joe comic I didn't even know existed at all that has Chun-Li facing off against one of my favorite Cobra characters The Baroness. Couldn't go wrong with that one. More Street Fighter here. 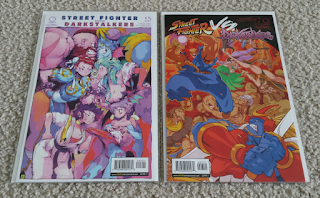 After assembling all the Rob Porter variant covers for Street Fighter vs Darkstalkers, I figured I should go ahead and get the ones he didn't do to fill in the gaps, so I picked up these two online. I don't really have much to say about these since I just bought them to complete the run up to that point. I visited a rival comic book shop (controversy!) 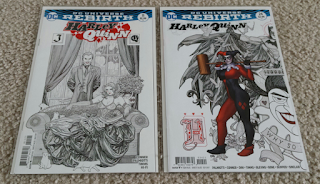 the other day and I found two Frank Cho Harley Quinn variant covers I needed. 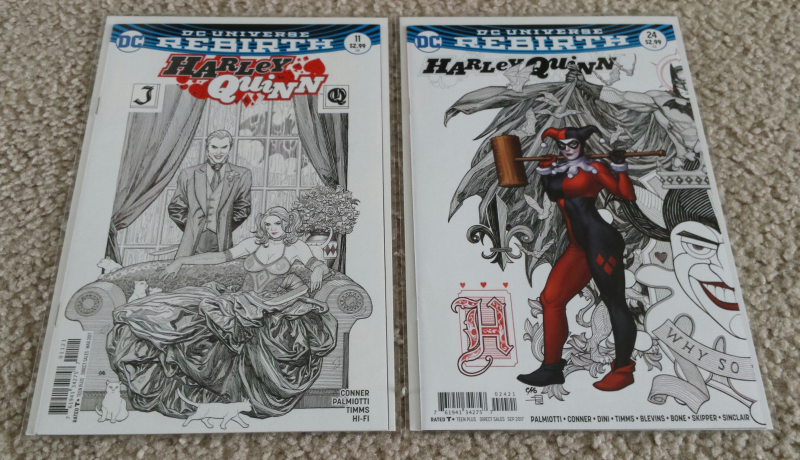 Now that I have these, I am only missing one of the variant covers he did. It showed up on My Comic Shop one day but by the time I got around to buying it that afternoon it was already sold out. If you're interested, the only one I need now is #14. It'll show up again one day. So these. In my last haul I showed pictures of Superior Spider-Man and the volume of Amazing Spider-Man that came immediately after it. I have been trying to fill in the gaps from where I left off at #700 and get caught up before #800 comes out. So naturally I bought these because this is the run after the one I just read. Let me tell you, I hate this book. It's incredibly boring and I'm not enjoying it at all. I feel like I have missed out on a whole other book between the last issue of the previous series and #1 of this one. Maybe I have. Maybe an annual fills in the gaps. All I know is that I hate this book and every issue has been a struggle to get through. 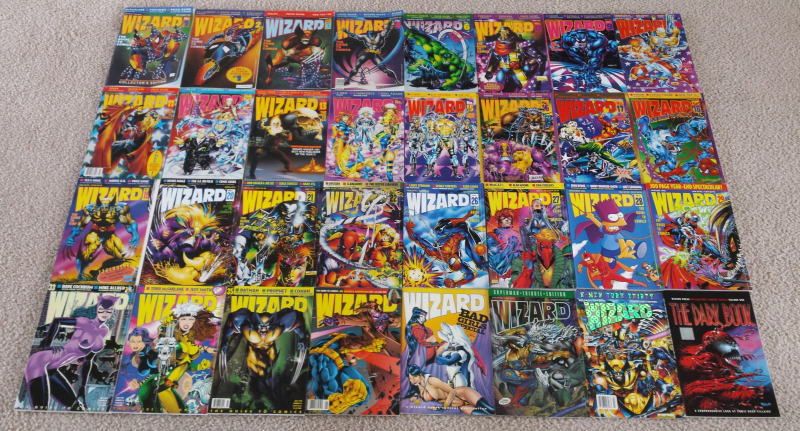 Last time I think I posted that I was re-buying old issues of Wizard Magazine. Well, I have continued to do that, and here is my current collection. Usually when I buy comics online I set a maximum price I want to spend before I start adding stuff to my cart. 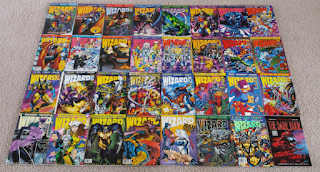 Eventually if there's nothing left that I can get that'll not put me well over my limit, I'll fill in the rest with a few issues of Wizard. It's really nice to go back and look at these issues and see what was popular back then. Seeing some of the stuff that they were hyping up big that today are worth a few bucks at the most is fascinating. Additionally, there's Hero Illustrated. 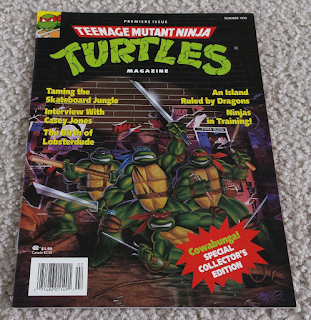 This was another magazine I used to get. It was never the must-have that Wizard was, but it was definitely serviceable. I don't remember if any of my friends used to read this or not, but I definitely used to. Pretty sure I used to have all of these issues before I threw them all away, too. Never throw your things away, kids. This is another magazine from my youth. I had a few of these, maybe three, and I have no idea what ever happened to them. They're very basic, very thin magazines for the Teenage Mutant Ninja Turtles fan. I used to have a poster of that cover on my wall. Wish I still had it. I believe, though I can't confirm it until I acquire more of these magazines, that this magazine was the first time I ever saw the toy line Monster in My Pocket. I'm pretty sure there was an ad for them in one of the issues and that's what sent me down the tiny rubber monster path. 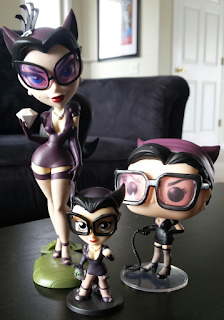 And finally, here are a few Bombshell Catwoman figurines I have bought. The tall one on the left is from the DC Comics Bombshell vinyl figure line. I also have a Harley from this line. Then there is the Funko Pop! Vinyl on the right. I went through eight of these things trying to get one that was in good shape. I had to settle for this one, as she's still not perfect. I don't know why the quality control has slipped as much as it has on these, but out of eight not one was okay? The small one was from a blind buy canister. I also have two Harleys and a Zatanna from this line. And that will do for this comic haul. Like I said in the beginning, there were more things that I bought but I accidentally didn't get pics of them before putting them away. This should have been enough to browse through, though. Until next time.